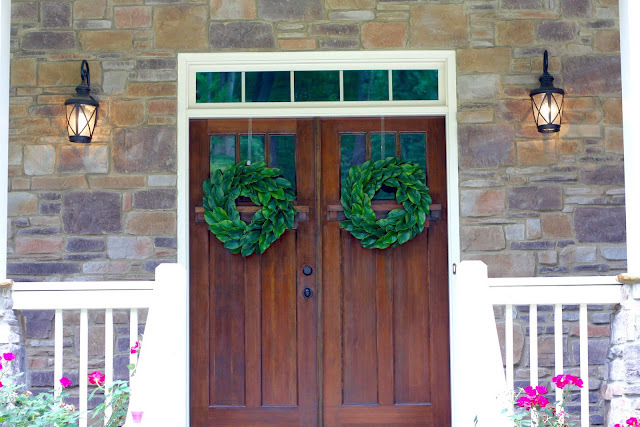 It's no secret that I love all things farmhouse including the use of greenery and wreaths both indoors and out. 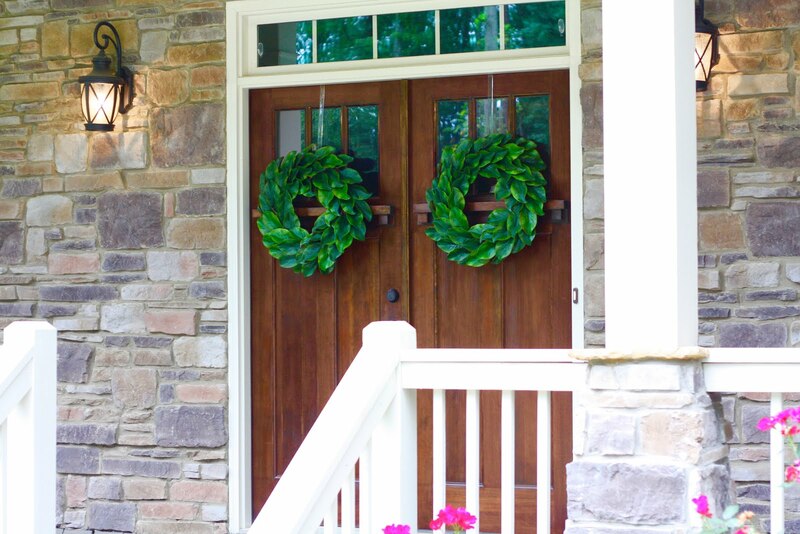 I have two of these boxwood wreaths that I had tried to use on my front doors, but instead they found their home indoors instead. I've really been wanting a magnolia wreath for a while now, but didn't want the steep price tag that most of them come with. I love the look of them though and the southern ties that magnolias have! These were just a few of the ones I was swooning over! 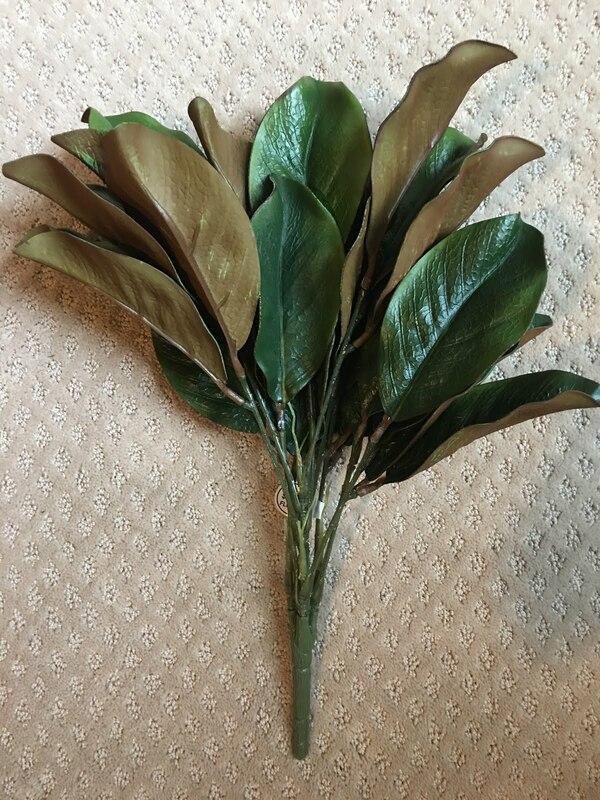 After visiting my local craft store to search for some basement decor I came across some pretty real looking silk magnolia leaves and an idea popped in my head. 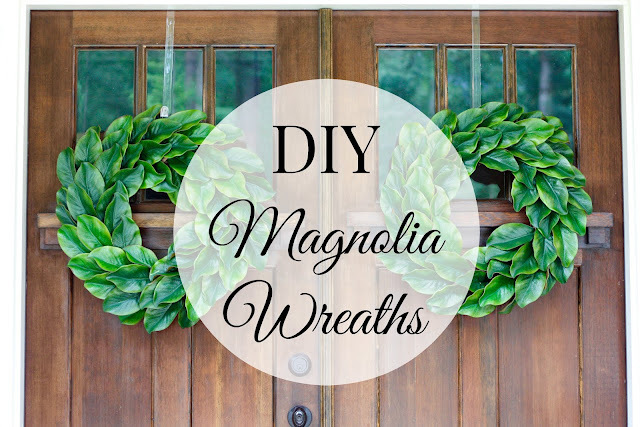 I decided that I'm not stranger to making my own wreaths so I got to work and made my own DIY magnolia wreaths! I have to say, these might be some of my very favorite wreaths I've ever made and probably the easiest by far! 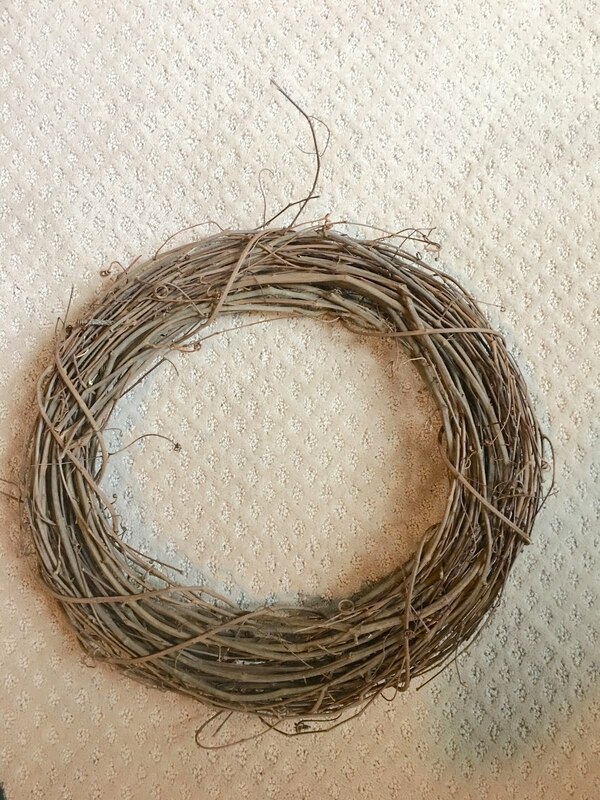 I started with basic grapevine wreaths. 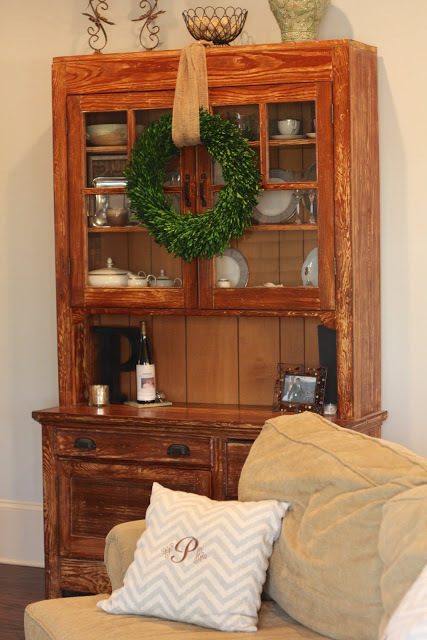 I had one at home from an old project and the other was 50% off at my local craft store so I paid less than $5 for it. Then I bought this bunch of magnolia leaves that look and feel so real. I also had a coupon for them so they were less than $10 each. 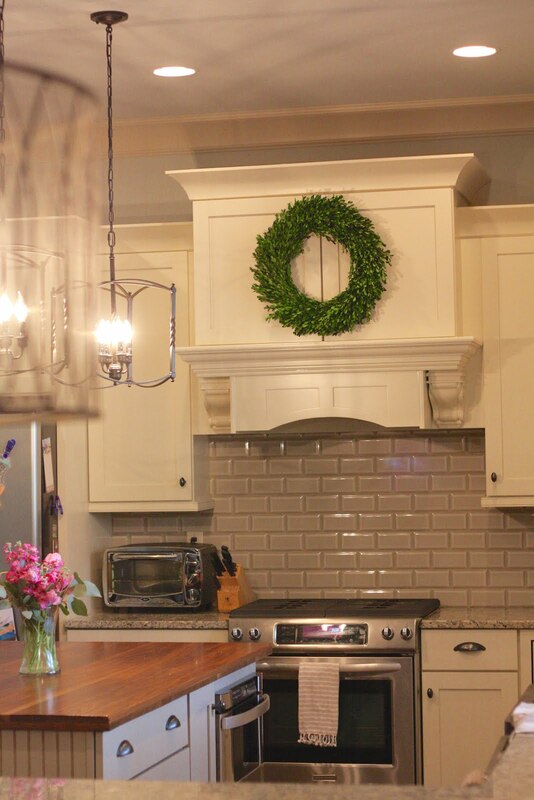 I bought two bunches for each wreath because I wanted them to be nice and full. 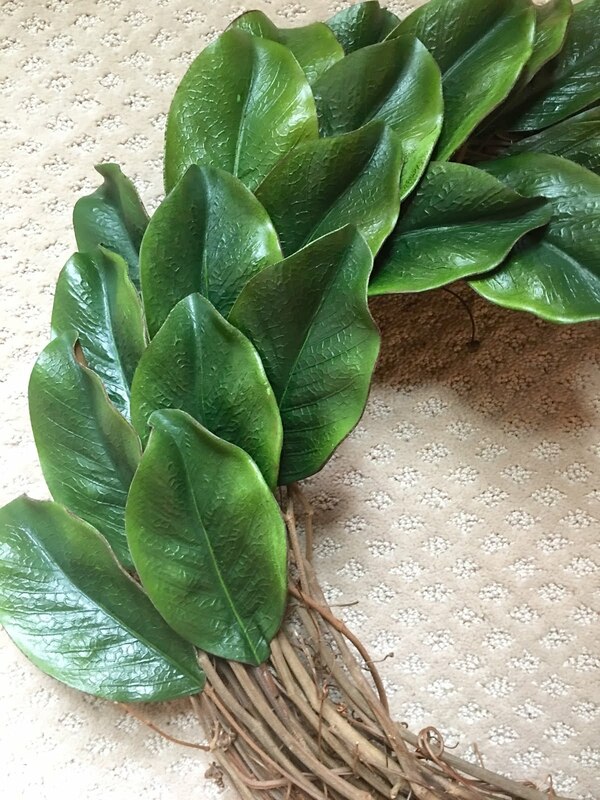 One thing you should know about any type of silk flowers or plants is that they can be taken part very easily. 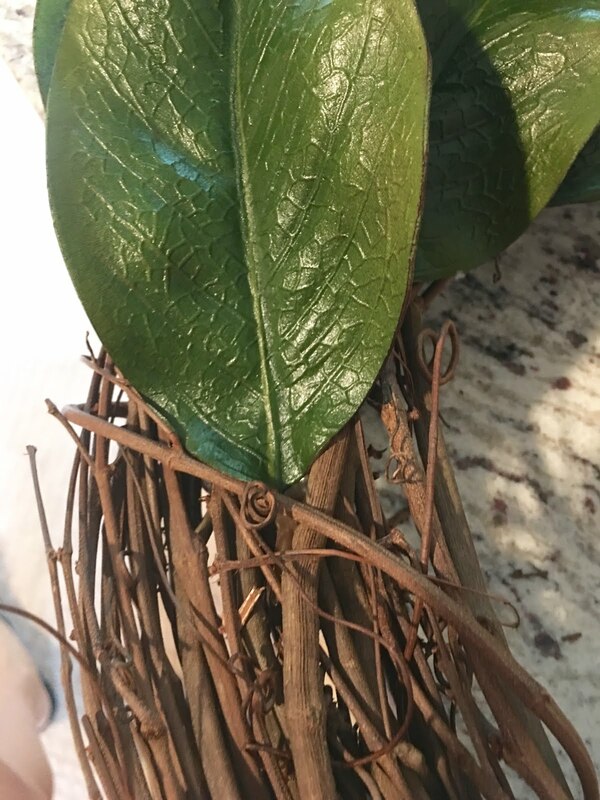 For this all I needed to do was pull on the leaves and they popped right off of the "stem" making it easy to take a part. Now I was ready to get started assembling the wreath. 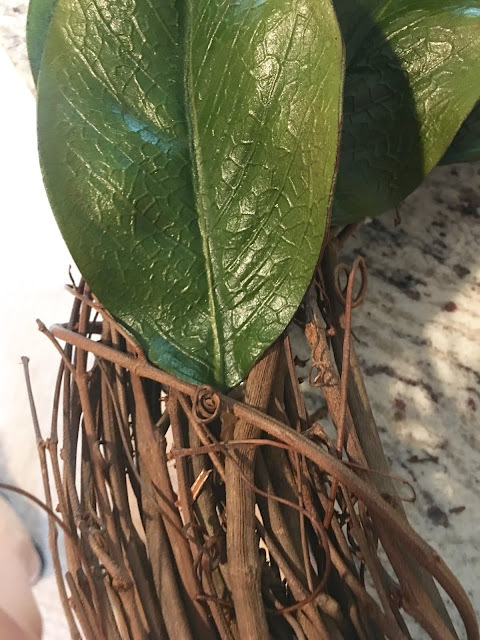 I started by sticking the ends of the leaves in through the vines just so I could see what it would look like and discovered it was going to be super easy to achieve the look I was going for. 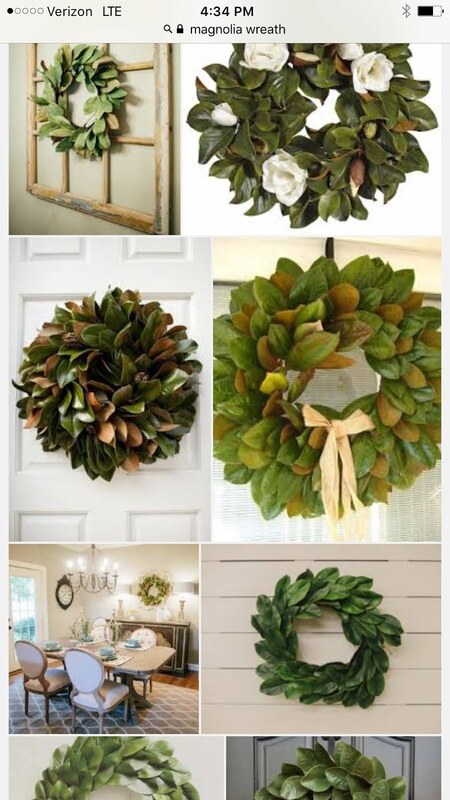 Using a hot glue gun I put a dab of glue the ends of each leave and continued sticking them into the wreath and over lapping each one as I went along. 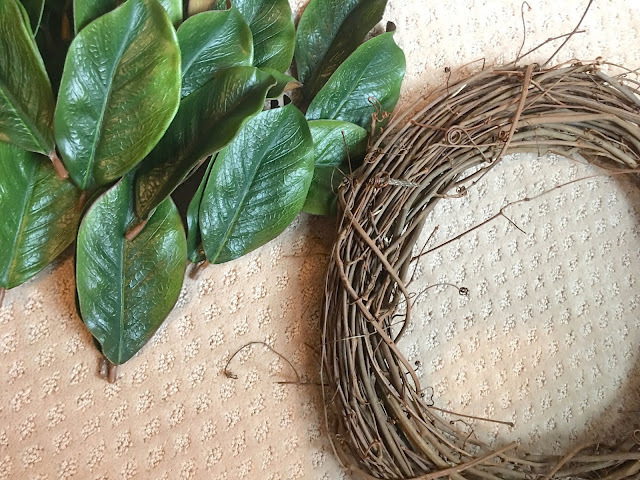 I used two bunches of the leaves to fill each wreath and went back with any extra leaves to fill in the gaps. 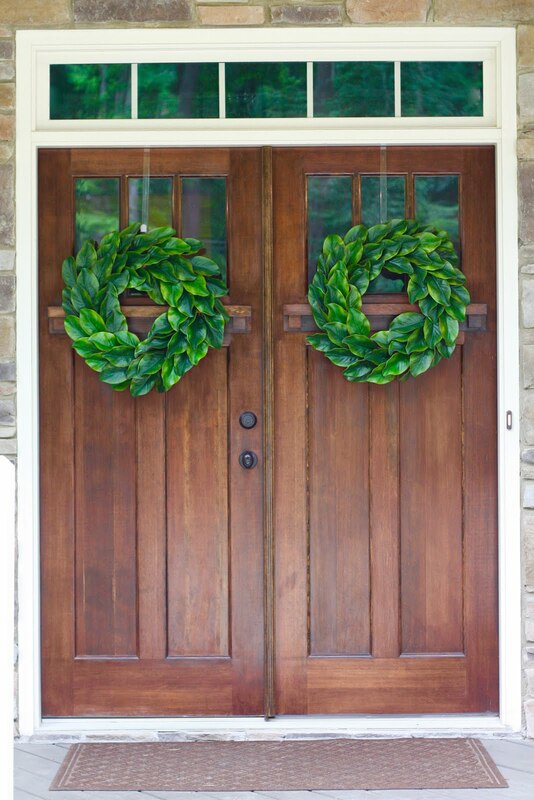 These wreaths took me less than an hour and I'm so happy with how they turned out. I had originally made them to go on the barn doors in our basement and I still might move them down there when the basement is complete (we're so very close!!! ), but for now I put them on my front doors because I couldn't wait to have them hanging somewhere! 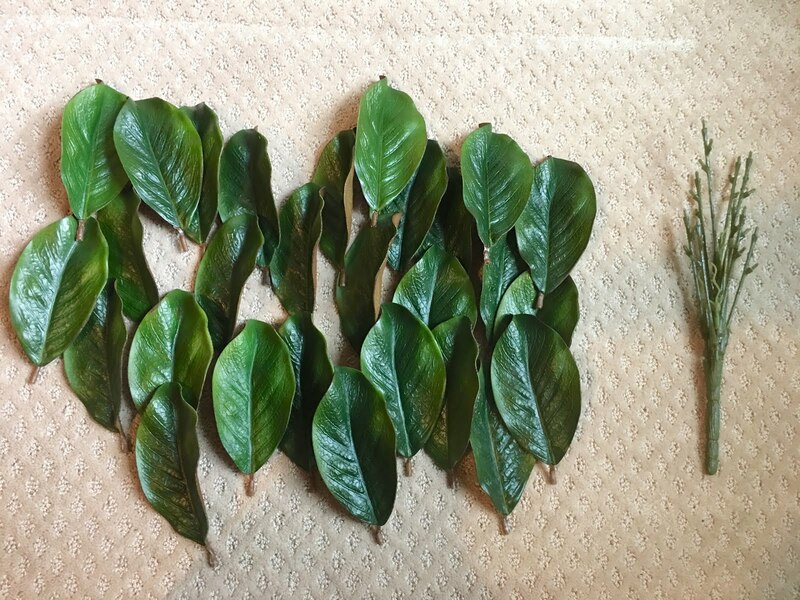 If you don't mind, where did you find the lovely magnolia bunches? The ones at my local chain craft store are oh-so-sad! Love these!! Do you mind sharing which store you bought the magnolia sprays at so I can go get some! I found them at Hobby Lobby!